THE DARK KNIGHT RISES: Christian Bale and Anne Hathaway Talk Hero Costumes! “The Dark Knight Rises” written and directed by Christopher Nolan (The Dark Knight, Inception) re-visits the famous caped crusader, Batman (Christian Bale) as he resurfaces after taking the rap for Dent’s crimes in “The Dark Knight” in order to stop Bane’s (Tom Hardy) calculation plans to destroy the city. Two of the lead actors in the film, talked about working with Chris Nolan, their alter super hero egos, and how they adjusted to their costumes while making the movie. The reason behind the Bat suit is “Bruce Wayne feels monstrous. So he creates this monster in order to channel that. With Anne, the scenes where she’s not in her costume she keeps very real. But when in costume she is wearing it and not being over dominated by it. Not going over the top without making it too cartoonish,” explained Bale. When he realized that the end was here…when he wouldn’t wear the Bat suit again, Bale said it was “the last shot- I took a few minutes to myself to keep it on and realized that was the last time I’d have it on. These movies have meant a great deal to me”. 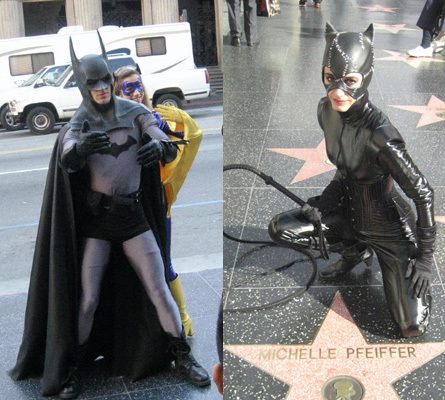 Batman (L) and Catwoman (R) characters on Hollywood Blvd. Hathaway reminiscences about one particular vivid memory while on “The Dark Knight Rises” film set “I had a moment where I was standing with Tom (with full Bane get-up) and Christian was wearing the Bat suit and I was dressed as Catwoman and thinking – this is either going to work spectacularly or we are going to look like rejects from Hollywood Blvd.” Luckily it wasn’t the latter! “The Dark Knight Rises” opens in theaters Friday, July 20 2012.